70AD. Disgraced, dishonoured and banished into exile on pain of execution if he ever returns to Rome, the former military tribune Gaius Valerius Verrens makes his way East through the death and destruction of the savage Judaean rebellion. Valerius knows his only hope of long term survival and a restoration of his family's fortunes lie with his friend Titus, commander of the Army of Judaea and son of the newly crowned Emperor Vespasian. But when he reaches the ring of legionary camps around the seemingly impregnable city of Jerusalem he finds Titus a changed man. Gone is the cheerful young officer he knew, replaced by a tough, ruthless soldier under pressure from his father to end the insurrection at any cost. Soon, Valerius finds himself at the centre of a web of intrigue spun by Titus's lover, Queen Berenice of Cilicia, and her sometime ally, the general's turncoat adviser, Flavius Josephus, who have an ulterior motive for ending the siege quickly. Yet the laurels that will regain his honour cannot be won in the negotiations in the murky tunnels beneath Jerusalem. Only amid the fire and blood of battle will he equal the glory that brought him the title Hero of Rome. 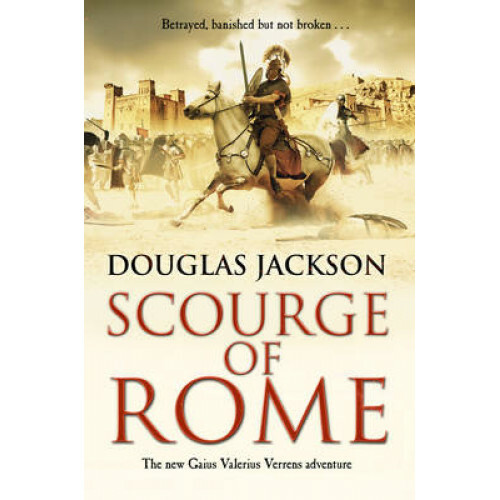 A journalist by profession, Douglas Jackson transformed a lifelong fascination for Rome and the Romans in to his first two novels highly-praised novels, Caligula and Claudius. His third novel, Hero of Rome, introduced readers to his new series hero, Gaius Valerius Verrens. Defender of Rome, Avenger of Rome and Sword of Rome followed, winning critical acclaim and confirming Douglas as one of the UK's foremost historical novelists. An active member of the Historical Writers Association and the Historical Novels Society, He lives near Stirling in Scotland.